Of course you have, who hasn’t? An estimated 45 million Americans diet each year and spend $33 billion annually on weight loss products. Yet, nearly two-thirds of Americans are overweight, according to Boston Medical Center. So, if diets worked we would all be thin, right? Lets start off with this, they work, but only for so long. The real issue with dieting is the negative impact it has on our long-term weight management and health. In short, down with dieting. We need to rethink our approach to weight loss. Dr. Hyman, a functional medicine doctor, estimates that the average dieter gains 11lbs. per diet. UCLA researchers have found that the majority of people regain all the weight, plus some post dieting. Sustained weight loss was found only in a very small minority of participants, while complete weight gain was found in the majority. Diets do not lead to sustained weight loss or health benefits. 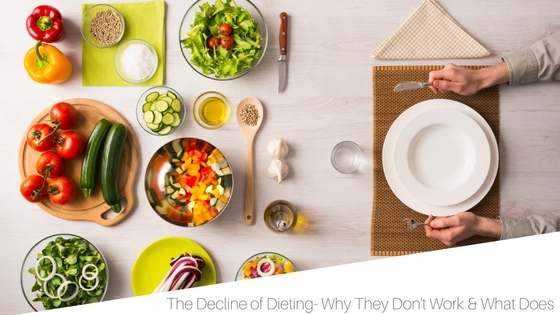 So why are we still dieting? Does this mean you are stuck with your current weight and weight-loss is never possible? Here are 4 ways we tend to self-sabotage when it comes to dieting. Plus, simple mind-shifts for you to create a healthy relationship to food. Meet your weight-loss goals by focusing on these simple strategies. Self-Sabotage #1: Deprivation and extremism simply don’t work. Ever. Our bodies are highly intelligent. Get cold, you shiver to warm up. Your lungs never forget to breathe. Think about it, our bodies are constantly working for us, creating equilibrium. When we cut back on our food intake, with the attempt to loose weight, our body does not know we are consciously doing this. From an evolutionary standpoint, this cutting calories sends a strong signal to our nervous system that something is up, think famine. Your body, therefore decreases metabolism, burns fewer calories, decreases energy, increases cravings and holds onto fat. All and all, creating an uphill battle to weight loss. Work with your body instead of against it. Don’t skip meals. Don’t get hungry. 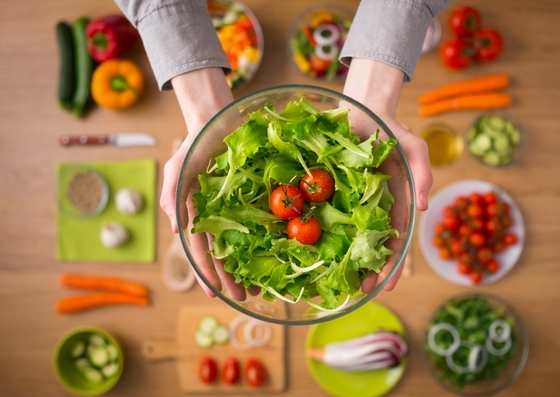 Decrease unhealthy foods like sugar, trans fats and refined carbohydrates but increase your daily dose of veggies, whole grains, healthy fats, and lean proteins. Back to the idea that our bodies are constantly working for us, when we have a craving, it is your body telling you a very important message. Shift your mind-set to view your cravings as an important health cue. Now, if you are craving a candy bar, no you do not need a candy bar. Start to learn to deconstruct your cravings and decipher these important messages. A craving for sugar could be lack of protein, need for hydration, gut microbiome imbalance (need for more fermented foods and healthy gut flora) or something “sweet out of life” like a break from work, movement or connection. What are you really hungry for? Start to get in the habit of asking yourself this very question before satisfying a craving. When your blood sugar drops and you enter into that “hangry” state (you know what I am talking about), no one, ever makes a good decision. Looking for weight management and/or weight loss, then look to create balance with your blood sugar and hunger cues. Have a healthy breakfast with some protein, veggies, healthy fat and/or a whole grain. Think smoothies, eggs, smoothie bowls, oatmeal, or over-night oats. Keep healthy snacks like pre-cut veggies, nuts, avocado or a hardboiled egg with you so you don’t get hungry during the day. Focus on adding healthy food in, verses taking things out. The more good stuff you add in, naturally the less room you have for the not so good stuff. Not all calories are created equal. Think about it this way—I ask you to eat a whole bag of potato chips. If in the right mood, you can easily do it. However, try to eat a whole bag of carrots and this task is not so simple. Whole foods are packed with fiber, vitamins and minerals, all which communicate with our hunger cues and digestive system very differently. No need to calorie count, eat a balanced diet with lots of fruit, veggies, whole grains, lean protein and healthy fats. Over look the calories and focus on keeping your food clean & real. Clean eating means to stay as close to the source, as much as possible. So eating foods that look the way they did when they came out of the ground or off the tree. Read all food labels, and when I say all, I mean all. What is in your BBQ sauce, salad dressing, seasonings etc. Stick to 7 or less grams of sugar per serving and you should be able to picture & pronounce all the ingredients in your packaged foods. Many foods that are labeled low fat or low calorie are loaded with artificial ingredients & sugar, simply not good for your health or weight. So, keep it real. Self-Sabotage #3: It worked for a friend, it must work for me. 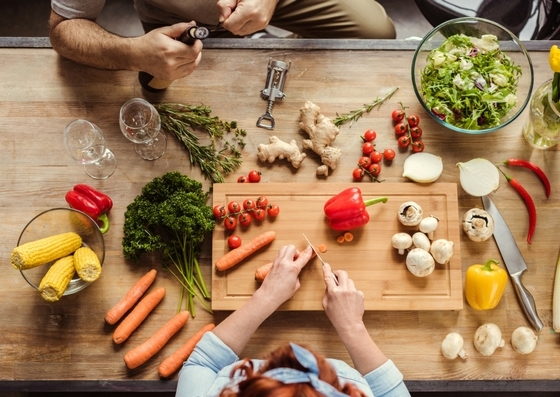 Ever wonder why there are so many fad diets and each one tends to contradict the other? Bio-individuality. What works for one person, does not always work for the next. Some people can eat dairy just fine and others simply can’t. The way we personally digest food, absorb nutrients and balance our weight is highly individual. Put the ball in your court and get really clear on what foods feed you best. How to do this? Start to track. Connect food with mood, energy, skin health, alertness, weight loss, bowel movements, feelings of bloating etc. How do different foods make you feel? We all know this story, “I can’t make it to the hour yoga class, may as well not practice at all.” Or “I blew it at lunch, might as well have dessert with dinner”. Stay focused on creating simple and sustainable habit shifts that make you feel good in your mind and body. Point your arrow to health and the weight will happen. We often overlook the real goal behind weight loss. We all want to be healthy, live in bodies that work well and enjoy this life. Let health be the vehicle that gets you to what you really want out of life. Let that be your motivator for behavioral change, not some number on a scale. This is an exercise I do with all my clients. Get clear on what your personal definition of health is. It is different for everyone. What does it feel like, look like, taste like etc. Is it running a triathlon or walking 30 minutes a day. Does it extend into your relationships, career, finances and social life? Get clear so you can work in the right direction and focus on filling up with what you are really hungry for. Don’t let it be about a diet, but a permanent, sustainable lifestyle change that makes you feel good inside and out!